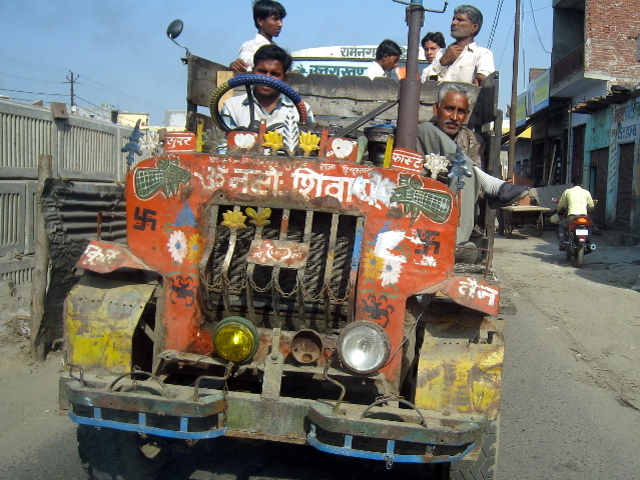 Sudhir Gota, a 2013 Lee Schipper Memorial Scholarship recipient, reports on the Indian government’s misleading statistics on diesel consumption and CO2 emissions in transport. Photo by Sudhir Gota. India’s love for diesel in the transport sector is over! At least, this is what Indian government data on diesel consumption would suggest. Official statistics report low consumption and stagnating growth of diesel fuel in transport. However, this data contrasts starkly with experts’ findings that both diesel consumption and CO2 emissions from transport are on the rise. The reality is that the Indian transport sector’s thirst for diesel is actually increasing at an alarming pace. India’s transport sector is powered largely by diesel, which accounts for 60-70% of transport fuel consumption. Currently, India consumes 33 million tons of diesel each year for transport purposes alone. Recent reports from Indian agencies raise further cause for concern. 2012 and 2013 reports have reallocated diesel consumption from the transport sector to the mysterious “miscellaneous services” category. In these reports, transport accounts for less than 10% of what it used to, causing it to appear that consumption dropped dramatically. The 2011 diesel consumption value has been adjusted from 33 million tons to about 5 million tons. The miscellaneous category, on the other hand, is now ten times larger. There is no definition as to what exactly is considered “miscellaneous”. The result of these recent reports is that is appears that CO2 emissions from transport in India dropped by about 85% in just two years. The decrease is equivalent to the annual transport CO2 emission of the entire country of Indonesia. These numbers clearly do not tell the whole story: this so-called reduction is not a cause for celebration. Bottom up data reveals a completely different story. Over the same period where government data showed a drop in diesel consumption, the number of diesel vehicles on India’s roads increased two to three fold. Analysis of data from the Society of Indian Automobile Manufacturers reveals an annual growth of 14% in sales of diesel consuming vehicles from 1990 to 2011. In this time, India’s freight activity has doubled. Trucks are covering more ground and burning more fuel. The relative affordability of diesel compared to gasoline in India has made the use of diesel in passenger cars attractive. CSE suggests that In 2011-12, diesel cars accounted for over 40% of the total car sales in the country. Industry experts believe that by 2015, diesel cars sales will be around 43%. Multiple research groups using Lee Schipper’s ASIF framework have found stark discrepancies between government statistics and on-the-ground reality. CO2 emissions may in fact be as high as five to eight times the official reported values. While researchers may not agree on the exact amount of diesel consumed, even using the lowest estimates, it is clear that diesel consumption in the transport sector is increasing at a rapid pace. Under-reporting diesel consumption inhibits policymakers from finding solutions to decrease dependence on fossil fuels. Official statistics on low diesel consumption have created an artificial sense of comfort, preventing the issue from reaching the harsh glare of media spotlight. The only option is to expose the gap between what government statistics suggest and what experts reveal. Over the coming months, I will continue to post the results of my analysis here on TheCityFix in order to hold Indian government accountable and bring attention to the importance of reducing diesel consumption and curbing CO2 emissions. Sudhir Gota is a recipient of the 2013 Lee Schipper Memorial Scholarship and the Technical Manager for Transportation at CAI-Asia. He can be reached at sudhir.gota@cleanairasia.org.